1. First of all, I am not a big fan of Ryobi tools, but this table saw was quite impressive for its class. The ripping fence is solid and locks in place very, very securely. On the store display model, I yanked sideways on the fence and I could not budge it whatsoever. 2. The folding stand with its rubber feet are sturdy, and even when ripping plywood sheets, the stand does not move, walk, or wobble. 3. For anyone who might need to store or transport this saw frequently, the saw comes off the stand, and the stand folds, all in about 30 seconds. 4. This table saw has a right side table extension as well as an extendable outfeed support. 5. What I really like about this saw is the sawdust collector. Around the bottom of the blade attached to the underside of the table, is a plastic shroud which totally encases the bottom half of the blade. This shroud has its own dust port, to which is attached a large sawdust bag which goes right to floor level. The bag has a zipper along the bottom edge for emptying the sawdust. With the cuts I have made so far, all the sawdust has gone to the bag, with only a few miniscule grains of sawdust on the table after cutting. 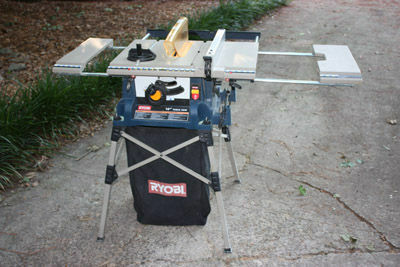 For a light class table saw, I have nothing but praise for this table saw, and as I said, I am not a big Ryobi fan. If I find any faults with this saw after 6 or 12 months of use, I will certainly post them here, but as for now I am happy with my purchase. -- LIVE, LAUGH, CUT WOOD. As a fan of the BT3000 series saw, I feel Ryobi has the potential to make some pretty neat equipment. Do have a question…..What is the diameter of the dust port? is it possible to hook up a Dust Deputy/Vac system for even better dust collection? Retrowood.. yes, the dust port is a 2 1/2” port, easily adaptable to a dust collection system or shop vac. I am also a Ryobi BT3XX fan. That opening for the blade looks like the same one that is on the BT3100. If it is, you should be able to make some ZCI’s for it very easily. I always felt like I was going to lose a piece of wood with the original throat plate. I have been pleasantly surprised with the quality of Ryobi tools for the price! Dallas.. yes, I definately want to make (somehow) a ZCI for this saw. I made one for my old saw, but the throat plate on the Ryobi just snaps into place, no screws, so I’m not sure how I’m going to go about it. I’m not good at metalworking. I had this same saw, but an earlier model. It was my first table saw. The only differences that I can see is the blade guard on mine was one big clunky piece and the dust just fell into a big bag underneath the saw. I bet the dust collection on yours in conjunction with a shop vac would be pretty good. Brandon.. the sawdust bag that you had on your model is much different than mine. After having used mine several times, I removed the elbow and dust bag on mine and looked into the dust port and I couldn’t see any sawdust whatsoever in the shroud under my blade.. it works extremely well. And as for the size and class of the table saw, it’s not as if I’m making furniture, only small crafts and small projects.. anyways, I don’t have room for a larger model. Right now I’m just working on trying to make a zero clearance throat for it. So far, I’m happy with the purchase. I picked up the Ryobi RTS30 about a month ago from a wholesale tool outlet. I used it for the first time about a week ago on some white oak. I have a new carbide Craftsman 10in blade with a blade stabilizer on the outside. It cut beautifully. I love the extensions, I made a couple of horses for the back side so I can rip large pieces. I do have my eye on the Porter Cable PCB220TS. I go to Lowes at least 5 times a week for something and I have to visit it every time. I think everyone at Lowes has my phone number if it goes on sale. I still have my small Craftsman table saw, and this PC will make three, but I still wish I had my old Cast Iron Craftsman. Trev, that’s a great looking saw and after reading your review I’m really thinking about getting it as it’s within my price range. Now that you’ve had it for a while do you find that when the right side exction is out with the rip fence that it is still square and true with the table? Also is the miter slide tight in the table? I read that some other brands (in this price range) had a some play there so the miter didn’t produce true 90 or 45 cuts. Blukey- The fence is solid. The miter is a joke, like most miters are these days, I like to get an old straight piece of wood about 10” long and screw it on the miter to give it some guts. The saw is surprisingly stable for a portable, I have the RTS30. The motor does have quite a magnetic field and BANGS when you flip it on though, which is annoying. Thanks Russell, that’s a good idea. Looks like the RTS30 & RTS20 are the same saw with different stands. They are indeed. I got lucky and found mine for $199. Blukey.. what Russell says is exactly right. The fence locks accurately and amazingly solid, I reef on it sideways with both hands and can’t budge it. As for the mitres, I always use an angle guage to set the mitres. And yes, the motor really fire up and noisy when you first flip the switch, but then it’s fine and is a good 15 amp motor. I like the table extensions, and I also got mine for $199. So far it suits my needs just fine. Mind you, I don’t make large furniture items, mostly crafts, and my shop is just a one car garage, so the portability of the saw is great for me. Trev, I also installed a blade stabilizer on the outside of the blade, not the inside between the motor and the blade. It cuts like a saw that you pay 4 times the price. I ripped large plywood today and I couldn’t tell my rip from the mill’s rip but for the blue paint on the end of the wood.